Being in outer space can have some odd effects on the body, including triggering dormant herpes viruses to reawaken, according to a recent review study. The review found that more than half of astronauts on space shuttle or International Space Station (ISS) missions experience a reactivation of herpes viruses, including those that cause chickenpox and oral herpes. Reactivation means that a virus starts replicates again, but doesn't necessarily cause symptoms. Fortunately, very few astronauts actually developed symptoms from this virus reactivation. But researchers are still concerned, in part because the odds of herpes viruses becoming active again increase with the amount of time an astronaut spends in space. This means that virus reactivation may pose a bigger health threat on longer missions, such as a mission to Mars. "Ultimately, the information gleaned from these space studies will shape the way we prepare for and design exploration-class missions, beyond the moon and Mars, where reactivation of latent viruses could result in increased risk for" medical problems, the authors wrote in their paper, published Feb. 7 in the journal Frontiers in Microbiology. What's more, even if the astronauts themselves don't have symptoms, they can still infect others. 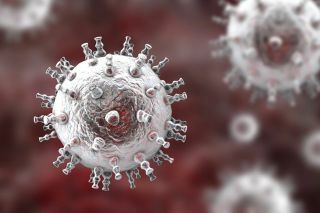 Herpes viruses belong to a family of viruses called Herpesviridae, which include the viruses that cause oral and genital herpes; the viruses for chickenpox and shingles; and cytomegalovirus and Epstein–Barr virus. All of these viruses go dormant after a person is initially infected, but can later reactivate, particularly during times of stress. And spaceflight is a notoriously stressful environment, one that includes exposure to microgravity, cosmic radiation, and extreme G forces during takeoff and landing, study senior author Satish Mehta, of the NASA Johnson Space Center in Houston, said in a statement. Astronauts also experience more-familiar stressors, including social separation, confinement and changes in sleep schedules, Mehta said. These stresses appear to take a toll on astronauts' immune systems. The researchers analyzed saliva, blood and urine samples from astronauts and found that during spaceflight, there is a rise in stress hormones that are known to suppress the immune system. "In keeping with this, we find that astronauts' immune cells — particularly those that normally suppress and eliminate viruses — become less effective during spaceflight and sometimes for up to 60 days after," Mehta said. This in turn provides a window for herpes viruses to reactivate. Out of 89 astronauts who flew on short space shuttle flights, 53 percent showed reactivation of herpes viruses in their saliva or urine samples, according to the study. The rate was higher — 61 percent — among the 23 astronauts on longer ISS missions. But only six astronauts had any symptoms from the virus reactivation. Still, with longer missions, the health impacts could be more severe and even include organ failure and vision or hearing loss, the researchers said. Coming up with ways to prevent virus reactivation, such as with vaccines, is important for ensuring the success of deep-space missions and preventing the spread of these viruses to vulnerable individuals upon the astronauts' return to Earth, the researchers said. Among herpes viruses so far, vaccines are available only against the varicella-zoster virus, which causes chickenpox and shingles.